I’m not sure about you (and at the risk of over generalizing), but I’m noticing a drastic change in how Americans communicate and how some media outlets treat the subjects of their stories today. While I don’t intend for this to be a political commentary, I’m sensing an appallingly intolerant tone from some of those running for president, with many candidates seeming to strike an “us versus them” chord when articulating their platforms. If you look at many magazine covers or news programs, sensational stories seem to overtake the positive pieces, with a growing percentage focusing on a “villain,” rather than a “hero.” And I’d be lying if I told you that I’m able to easily stomach the horrific shootings of police officers, minorities, theatergoers, students, military members, reporters, etc. and simply accept these deaths as “normal behavior” because…well…it’s America. Could there be a new, lowered standard in the amount of respect that people are willing to give one another? I’m petrified of becoming desensitized and, frankly, do not want to become comfortable with the increasingly hateful rhetoric and negative media portrayals. As someone who was raised to see the best in people, I obstinately want to believe that there is some logical causation for why some people are choosing to hurt one another with words or actions. Is it stress? Or fear? I don’t intend to oversimplify the reasons, but I am the first to say that I can always strive to do more for others and be better every day. In searching for potential solutions to counter what I perceive to be a dangerous and divisive cultural phenomenon, I’m reminded of a quote from Anne Frank, the teenage Holocaust victim who authored a personal diary. Frank’s account of her horrific situation was filled with optimism and a surprising amount of hope for her future in spite of the looming threat of being captured by the Nazis during World War II. But how does one improve the world? It’s a daunting question to ask oneself, because the answers may require a change in behavior or, at the very least, taking some sort of action. And bluntly, how could anything I do result in world improvement? The idea that the boy was not daunted by the sheer enormity of the task before him and was willing to focus on one starfish at a time is both inspiring and manageable. 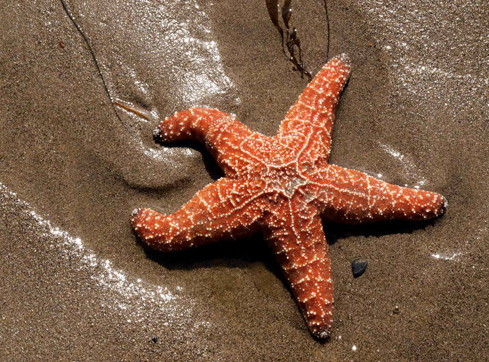 Imagine the effect we could have on the world if each of us found our own figurative starfish. I know how humbled and special I feel when someone goes out of his or her way to demonstrate kindness toward me. I’m also energized when I’m put in a position to lend a hand to someone who least expects it. Who knows? There might be a correlation between world improvement by performing one good deed at a time. 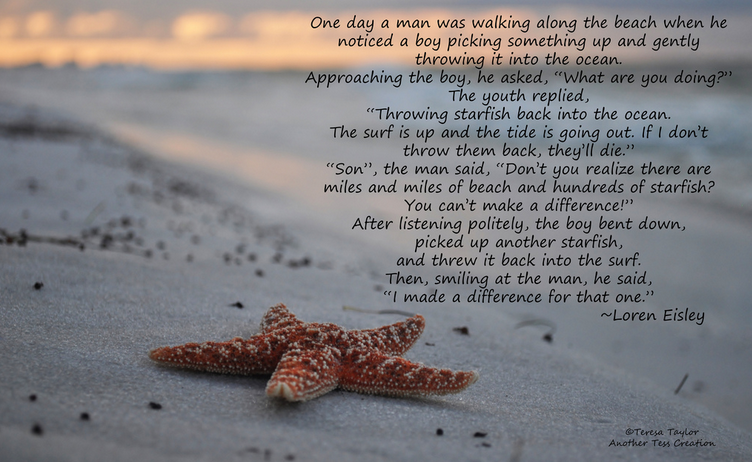 I tend to believe that we are all starfish. There are times in our lives where we all need a friend, a favor, a sounding board or someone to gently guide us back into the surf. If you are local and need someone to walk your dog or watch your kid in a pinch, please ask. If you are seeking a partner to work with you on your communications strategy, I’m your gal. If you’re experiencing a tough day and need to talk it through with a friend, I’m here. If I can be that supportive person for you, I’d sure like to try and help. 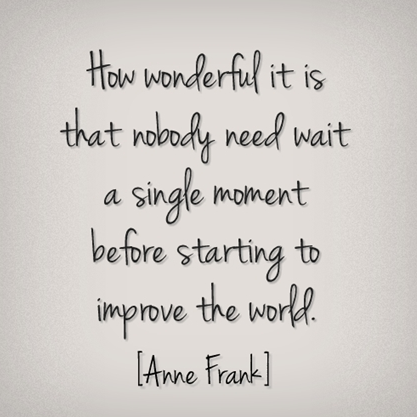 Taking Anne Frank’s beautiful words to heart, I’m standing up to fight the negative rhetoric with a vision of improving the world. To start, I’m setting a goal of performing 30 good deeds in September. I plan to share a few of the good deeds on my social media channels, using the hashtag #WeAreAllStarfish. I’ve even set up a new email address to field your requests – WeAreAllStarfish@gmail.com. You never know…you might be inspired to join me in performing a good deed, as well! I’m excited to embark upon this journey and look forward to sharing what I learn along the way. This entry was posted in Giving Back and tagged compassion. Bookmark the permalink. I fully agree with you. Albeit I think our world has become more bipolar than ever for the moment (or at least as far as my memory tells me): Rich vs poor, Christians vs Muslims, …its all about competition, winning..with a high dose of irrational behavior fueled by greed, ignorance and some type of propaganda. Common sense lacks everywhere. People communicate the way they experience and right now, they don’t experience togetherness, more of a fracture. Some are surfing on that because as Nietzsche said: Whoever has provoked men to rage against him had always gained a party in his favor, too.. Fortunately, it’s short sighted; Back in 2000 or so, I remember Bush saying “if u’re not with me, you’re against me” which in a way turned everybody against him at the end. Love this! I could not agree more. Thank you, Patti! I’m hopeful others will join me in performing good deeds for others. Wishing you the best! Well spoken, agree 100%. Thank you for taking positive steps and inspiring others to do the same.